At the beginning of the demonstration already 20'000 people participated. More will join during the course. Padeluun from the alliance "Freiheit statt Angst" (Freedom not fear) says "this a great success and it motivates us for the upcoming struggles." During the manifestation at the beginning of the demonstration, Frank Bsirske, chairman of the ver.di union with more than 3 million members spoke about the protection of employees' rights. 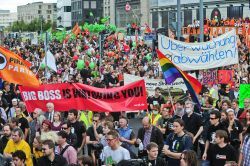 Now, the protest march is on its route through the centre of Berlin. It continues its route to Potsdamer Platz where it will have a final manifestation.